- Great for home decor, modern minimalist design and its clean lines are greatly suitable for decorating your windowsill, desktop, kitchen, bathroom, office and bedroom. 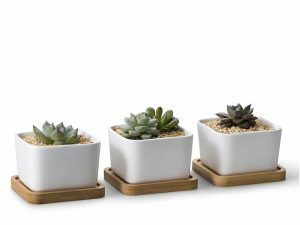 - Set of 3 white ceramic plant pots all feature holes at the bottom for proper draining of live plants. - 60 DAYS WARRANTY: 100% OPPS Satisfaction Guarantee. We back up with 60 days warranty (defection, accidental damage, non-satisfaction).